In Black Mountain, North Carolina, no one heard a sound on the day that America died. Retired Army Colonel John Matherson was busy preparing for a simple barbecue for his youngest daughter, when all power to their picturesque home goes dead. The phone lines too. And almost every car on the nearby highway. It doesn't take a series of mushroom clouds on the horizon to mark the end. It only takes a few, set off somewhere above the atmosphere of an unprepared nation. The effect, generating an electromagnetic pulse (EMP), kills every electronic device from coast to coast, plunging the entire country backward some 200 years. This story, told from the perspective of Matherson, sticks close to its North Carolina roots, with only refugee rumors and later, propaganda-laced broadcasts from Voice of America, providing any glimmer of news from the outside world. Not that they would have time to reflect what might be happening elsewhere; the residents of Black Mountain have to plan for survival. One Second After Is A Haunting Reminder Of Vulnerability. Three years ago, I had the interesting experience of covering the cancellation of a television show called Jericho. And given that I once described the show as the "story of survival in a small Kansas town that has been mostly cut off from the outside world after a disaster shatters what most of us take for granted in America," it's almost impossible not to see some strong parallels. Sure, the Jericho story ignites with nuclear explosions and not the eerier threat of an electromagnetic pulse. But the thrust of the two stories after the initial opening are much the same, with Black Mountain being less tame. Before securing some semblance of societal order, most of the stores are well looted. Food becomes a primary focal point, not a conspiracy. As compelling as the story is, author William R. Forstchen sometimes struggles with the human relationships in the story, relying much too heavily on asking the characters to frame their feelings based on film mentions. He is much more comfortable retelling much of the story with sweeping accounts from the main character, who is partially modeled after him. Specifically, you won't find rich characterizations like you might in Stephen King's Under The Dome nor will it read as touching as Cormac McCarthy's The Road. However, this point may be forgivable given that unlike the aforementioned books, this is a tale told on the grand scale of truth. It is a warning without apology. So much so that Forstchen dedicates space on his Website to the government report on the EMP threat and what you can do about it. What can you do? Not as much as you would like. Neither can Forstchen's characters, who come to the startling realization of just how dependent we are on electronics. Nursing homes cannot be maintained. Medicines quickly become scarce. Anti-depressants run out. And even the smallest of towns like Black Mountain find that they are well over their carrying capacity. “... frankly I don’t care about the finances that come from a success (and I know that might sound like a line.) I urge you to read it because it is about US. You, me, my daughter, my friends, your friends ... our country." One Second After Earns A 6.5 On The Liquid Hip Richter Scale. One Second After is a compelling what if story that would have performed even better had it not become distracted by the reality of its premise. But with that said, there are probably some readers who will still be engaged throughout much of the book. I say "much of the book" because there does come a point when Forstchen stops showing us a story and Matherson starts telling it. On Amazon, One Second After retails for about $17. 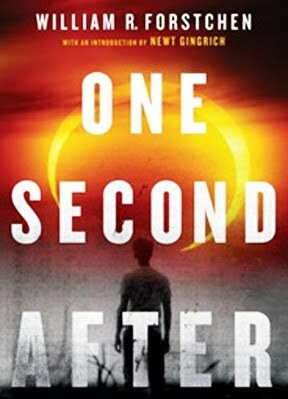 One Second After on Kindle is $9.99. The audio version of One Second After will bypass well-documented editing misses. Joe Barrett narrates, which is both good and bad for the book. Good in that there are moments he adds additional life to Matherson. Bad in that Matherson's children seem even more sheltered than in the written version.